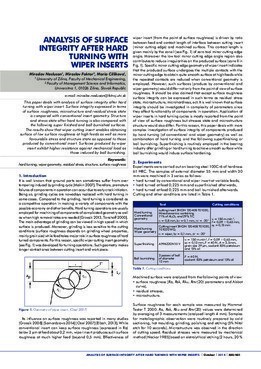 This paper deals with analysis of surface integrity after hard turning with wiper insert. Surface integrity expressed in terms of surface roughness, microstructure and residual stress state is compared with conventional insert geometry. Structure and stress state after hard turning is also compared with the following super finished and ball burnished surfaces. The results show that wiper cutting insert enables obtaining surface of low surface roughness at high feeds as well as more favourable stress and structure state as opposed to those produced by conventional insert. Surfaces produced by wiper insert exhibit higher resistance against mechanical load as those induced by ball burnishing.